I lost sight of my Tackle it Tuesday posts when I hit a recent bump in the road. Katie has been hugely supportive in my time of need, and patient with my need to let go for a couple of weeks. She has been gently nudging me to get back on track, and I love her for it. Although I am not on the assigned task for this week, I am still tackling so I decided to share. 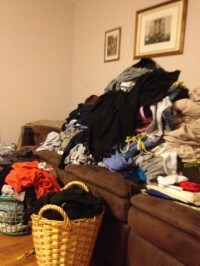 Today’s immediate need is this pile of laundry. Along with folding and putting away all of this laundry, I am clearing out the unused clothes that remain in the back of the closet and drawers. Check back next week for an update and maybe some pictures. PS: I am posting this from my phone, so I will set up links, tags, etc when I get to my computer. This week’s challenge is the top drawer of your dresser so this doesn’t fall too far out of that! I’m so proud of you for not giving up and for jumping right back in. Big hugs! haha That totally looks like a mountain of clothes that I had in the background of one of my YouTube covers (I think it was Doesn’t Mean Anything by Alicia Keys if I’m not mistaken) … I try to keep up with the laundry as best as I can because with 7 people in the house, it can get out of hand SUPER quickly! So that you don’t get it all piled up again once you finish getting it all put away, start trying to fold/hang up everything as soon as you take it out of the dryer. I keep hangers and an extra basket downstairs so that as I take each thing out, I can go ahead and handle it right then. I put on hangers what need to be in the closets, then I fold and place in the basket what needs to go in drawers and I go put it up right then. Takes like 10 minutes and keeps me from going nuts when having a couchful 😉 Good luck!